Blue microphones have helped the Internet’s favorite podcasters and YouTube stars take their projects to the professional level. Each Blue mic combines pristine sound with the inspiring design, versatility and performance found in the world’s leading studios. Blue has introduced the Yeti Broadcaster microphone. It is for podcasters. For years, podcasters have been searching for software that’s easy to use but not overly simplified, powerful but not overly complex. Journalist is the software we’ve been waiting for, and its now available with Yeti – the world’s #1 USB microphone. This limited bundle is only available on the Blue web store. Hindenburg Journalist is a multitrack audio editor designed for podcasters, audio producers, and radio journalists. The design and features are tailored for spoken-word productions. Hindenburg Journalist’s focus is on storytelling. Add sound and music by dragging any audio file into Hindenburg. Levels are set automatically in Hindenburg. 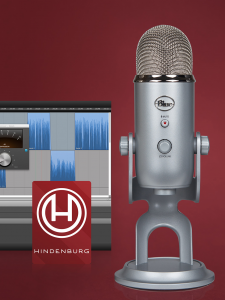 Hindenburg has a Publishing tool that lets you upload your podcast or share it on Libsyn or Soundcloud. Once you have set it up, you can publish with a single click.